Thinking back includes reflecting on how we have used charts, why we use charts, and what we do with the charts we have created. A chart, just like our teaching, is not static, it is constantly growing. That is our goal – to be constantly growing and evolving as we try to find ways to better teach in engaging, clear ways. Models are key, as are lots of times available for repeated, strategic practice (using the charts as concrete examples that guide the way). 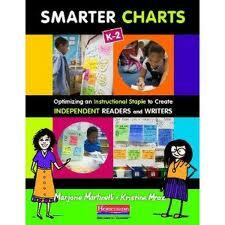 And looking forward, we will be back throughout the year with ideas to get you excited for August/September, and of course all of the important information about our upcoming book: Smarter Charts, available through Heinemann beginning August 16th. Feel free to give your comments on posts you’d like to see here in the future on chartchums.